The Australian Competition and Consumer Commission has announced that Cairns will be the fourth regional location to be studied as part of the petrol monitoring arrangements introduced by the Australian Government in December 2014. “Cairns petrol prices are among the highest in Queensland considering its size and location. However, the ACCC also considered a range of other factors before choosing Cairns, such as the price differentials between regional markets and larger cities, price differentials between towns of similar size, and the variability of prices in regional markets,” ACCC Chairman Rod Sims said. “In 2014-15 the average retail price of unleaded petrol in Cairns was 146.4 cpl (cents per litre). This was 12.3 cpl higher than prices in the five largest cities (i.e. Sydney, Melbourne, Brisbane, Adelaide and Perth),” Mr Sims said. The detailed regional market studies aim to explain each component of the prices paid at the bowser to understand why prices are higher in some regional locations. “Understanding why petrol prices in Cairns are so high will help us identify the steps that could be taken to increase transparency and promote competition in the Cairns fuel market. It should also provide some explanation of why petrol prices are high in other regional locations around Queensland,” Mr Sims said. The ACCC commenced its first regional market study in Darwin in March 2015 and released its report in November 2015. The ACCC is currently undertaking market studies in Launceston and Armidale and expects to report on these in the coming months. “On conclusion of the four regional market studies the ACCC will then review the overall lessons learned and how they may apply in other areas,” Mr Sims said. Companies throughout the supply chain are required to provide information to the ACCC under the compulsory information gathering powers it has under section 95ZK of the Act. The ACCC is also interested in obtaining information from consumers, industry participants, stakeholders and any other interested parties regarding the petroleum industry in Cairns. Relevant information can be provided to the ACCC via its website at our consultation hub by 31 July 2016.
the Darwin market study was announced on 10 March 2015 and the report released on 23 November 2015. Armidale was announced as the location of the third regional market study on 8 August 2015. The ACCC monitors fuel prices in all capital cities and around 190 regional locations across Australia. 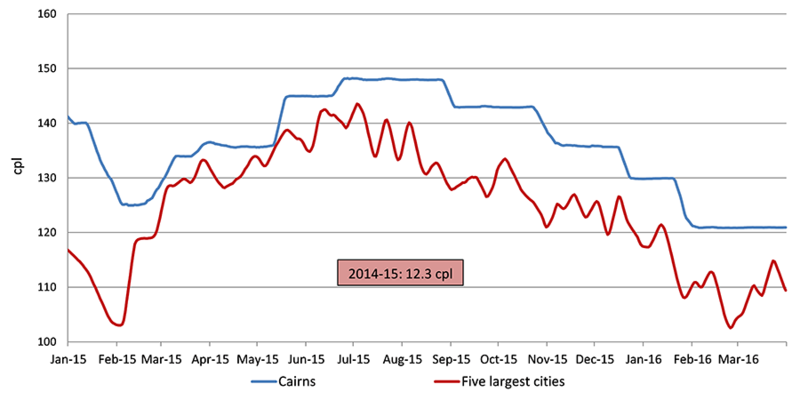 The chart below shows average daily petrol prices in Cairns compared with those in the five largest cities between January 2015 and March 2016. The monthly average difference ranged from a high of 25.3 cpl in January 2015 to a low of 4.1 cpl in March 2015. Source: ACCC calculations based on FUELtrac data.